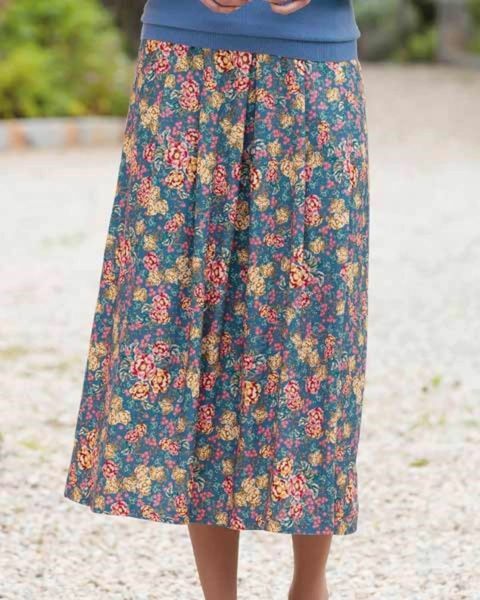 Ladies Floral Supersoft Viscose Skirt. Machine washable.Sizes 10-24. Ladies fully lined, all round soft pleated style with un-pressed pleats. Two button waist fastening with side back waist elastication and side pockets. Cut from supersoft viscose with exceptional drape. Attractive floral design with highlights of rosehip, mimosa and toffee on a blue base. Coordinate with any of our collection of blouses and knitwear to achieve a classic look.